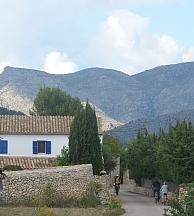 Catalonia, Valencia and ‘La Luminosa’, the ’enlightened’ isle of Mallorca – meet Spain’s specially selected crop for great scenic cycling holidays. Discover lands of orange groves and almond blossom; vineyards, volcanic hills and the leafiest ‘Via Verde’; Moorish castles and mighty monasteries; windmills and watchtowers. These more secret sides of Spain are full of contrasts from vast sandy beaches and bird-filled lagoons to the buzz of Valencia, the pull of Palma and the vibrant colours of Gironà and Dali’s birthplace, Figueras. Our self-guided cycling holidays and short breaks in Spain feature both linear and circular routes and include hotel to hotel cycling tours. Stunning scenic cycling just doesn’t come more gentle or more colourful than on this neat downhill tour through northern Catalonia. Follow the gloriously green ‘Via Verde’ cycle path through the ancient rural Catalan county of La Garrotxa, from the wooded volcanic hills by the peaks of the Pyrenees down to the blue waters of the Mediterranean Sea at the beaches and ancient port of St Feliu de Guíxols. Historic Girona, City of Four Rivers, is a real en route gem, with rich museum pickings and bright medieval houses leaning out by the Onyar River. In Olot, Girona and St Feliu de Guíxols. 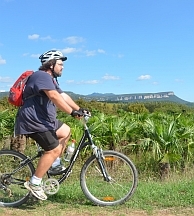 If you like beautiful beaches, a splash of city culture, paella at its freshest and deliciously gentle scenic cycling, then this tour from vibrant Valencia into the vast nature reserve of Albufera has to be for you. The university city is a great colourful mix of medieval and ultra-modern architecture just made for exploring by bike, but venture south down dedicated coastal cycle paths to the outstretched waters of the Laguna de L’Albufera and the rice fields of Spain and you could be in pedalling paradise. The beautiful beach-side Parador El Saler makes for a rewarding retreat complete with spa and golf course as well as a great base for circular tours inland to ‘rice capital’, Sueca, or down to Cullera, where flatlands and mountains meet by the Mediterranean. In Valencia and Parador El Saler (2 nights). This gentle pedal around Valencia’s unspoilt coast is a natural choice for discovering a different sort of Spain. Combine the colourful culture and contrasts of Valencia’s vibrant city life with easy-going cycling by the Med’s more secret sandy beaches as you sample the stunning world of the Albufera Nature Reserve and stay at a Parador in a beautiful beachside setting. Laze by the Albufera lagoon, pedal through pine forests, look out over rice paddy fields and citrus groves and maybe even get a taste for the freshest 'Paella Valenciana' down by the fishermen’s sailboats in El Palmar. 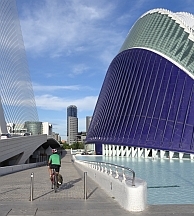 With your tour starting and finishing in historic Valencia, home to medieval 'Torres' and the striking contemporary structures of the City of Arts and Sciences in the famous Turia Gardens, this has to be the perfect Spanish city-countryside cycling combo. In Valencia (2 nights) and Parador El Saler. Enjoy an extra helping of captivating Catalan scenery up in the volcanic hills of the La Garrotxa natural park before wheeling away down via Girona to the blue waters and beaches near the ancient port of St Feliu de Guíxols. A rewarding circular route from Olot leads through the greenest and most peaceful countryside imaginable: a timeless world of hidden valleys, villages and waterfalls which makes for a really refreshing introduction to ancient rural Catalunya. 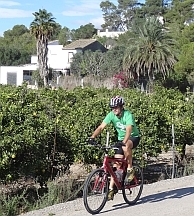 From volcano country, the gloriously green ‘Via Verde’ cycle path steers you downhill almost all the way to Girona’s gothic cathedral and colourful riverside, then finally to magical Mediterranean itself. 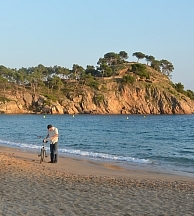 In Olot (2 nights), Girona and St Feliu de Guíxols. Ancient villages and vineyards, Greco-Roman ruins and rocky islands, the biggest bays and beaches and large dose of Dalí – the Empordà patch of Catalunya is not just full of contrasts, but is simply one delightful surprise all round. 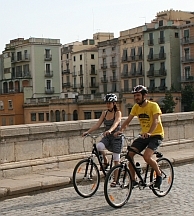 Set out for some great cycling down towards the magical Mediterranean from colourful Girona. Big beaches stretch out from L’Estartit as small roads and coast-hugging pathways lead north past the Illes Medes, L’Escala and the ruins of Empúries to beautiful Roses bay with its famous citadel. The Empordà wine museum here is a must to get the full flavour of the region before a route full of ancient rural villages leads back to Figueres, the local capital and birthplace of Surrealist painter, Salvador Dalí. In Girona, L'Estartit, Roses and Figueres. Rugged and time-ravaged, the sierras of the southern Valencia region offer super, scenic cycling with a rare helping of history heaped up on or hewn out of the landscape. Starting in Biar where the Moorish castle perches high on an outcrop, a cycle path along an old railway trackbed leads the way by the Serra Mariola nature reserve in the Vall d’Albaida to the mysterious underground ‘Covetes dels Moros’ and the monastery and bull-ring carved out of the rock-face at Bocairent. Keeping on track (alternative route options available) there’s a rural hotel stop where you can rest up by the pool or pedal off to nearby Fontanars dels Alforins with its fine wines and mansion houses, but this tour perhaps saves the best till last… the area around the Bellùs lake is as fruitful as it comes with market gardens galore and massively impressive vistas; then finally Xàtiva, home to noble ‘palaces’, tops everything off with a castle. In Biar, Bocairent, Fontanars (2 nights) and Xàtiva. A delicious story of vineyards, olive groves and Roses, this tour takes in all the fantastic Catalan contrasts of our five day tour from Girona to Figueres and adds some more superb cycling so you can really savour the flavour of Empordà’s vineyard slopes and explore La Gola del Ter estuary as well as the beaches, bays and creeks of the Mediterranean coast. 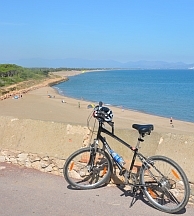 Leave colourful Girona to pedal past ancient villages for a first glimpse of the glittering Med at Sant Pere Pescador. Then it's round the mountain at Montgri towards the beaches of L’Estartit. Head west along La Gola del Ter, then venture north, riding alongside beautiful beaches and through the Aigamols natural park and visiting the ruins of Empúries en route from L’Escala to Roses bay with its famous citadel. The Empordà wine museum here is fine introduction to a day of cycling the vineyards in the foothills of the Pyrenees, before a route full of ancient rural villages finally leads back to Figueres, the local capital and birthplace of Surrealist painter, Salvador Dalí. In Girona, L'Estartit (2 nights), Roses (2 Nights) and Figueres. Enjoy the best of both Catalan worlds – stunning scenic cycling from the wooded volcanic hills of La Garrotxa natural park by the peaks of the Pyrenees all the way down to the blue waters of the Mediterranean Sea, then northwards up the coastline of beautiful bays and beaches to the refreshing vineyard slopes near Roses. 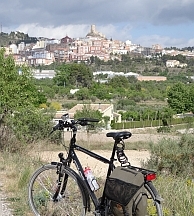 There are many ancient villages along the way; the colours and cathedral of Girona; small fishing harbours and great river estuaries; not to mention the surrealist spontaneity of Dalí’s Theatre Museum at Figueres, Greco-Roman ruins, rocky islands and of course, some really relaxing cycling. 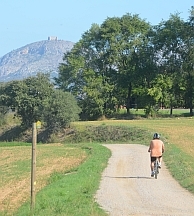 Catalunya and gentle cycling adventures were just made for each other. In Olot, Girona, St Feliu de Guíxols, L'Estartit, Roses and Figueres. A grand fiesta of fine scenery, a fascinating fusion of cultures – the true magic of ‘La Luminosa’, the ‘enlightened’ isle of Mallorca is just a two wheeled adventure away. Discover wide open plains,windmills and watchtowers and get up close and personal with craggy south coast coves. From the saddle, you'll get a different view of those eastern sandy beaches and be able to go wild in the mountains of the north-west. From Palma’s magnificent cathedral to the mighty monastery at Lluc, from orange groves and almond blossom to tiny quaysides and courtyard cafés, this tour has it all at just the right pace. In Playa de Palma (2 nights), Colonia San Jordi, Porto Cristo, C'an Picafort (2 nights) and Port de Soller. See a different side of Spain with this great linear tour right up through unspoilt Valencia, a region of rugged sierras and orange groves, dunescapes and pine forests, wine growing ‘fincas’, market gardens and Moorish castles and the wildlife-rich Laguna de L’Albufera. Starting at Biar’s Arabian castle on the border with the province of Alicante, pedal through the Valencian hinterland valleys, past the historic caves around Bocairent and the heart of the Serra de Mariola nature reserve. Visit Fontanars’ vineyards and the hilltop fortress and Borgia ‘palaces’ of Xàtiva, before moving on to the vast open skies, curious paddy fields and massive lagoon-filled landscape of the Albufera nature reserve. Finally, coast it up past the sandiest ‘platyes’ to that classic-contemporary combo – the vibrant university city of Valencia.